Earth Week is a opportunity to educate our youngest citizens around environmental awareness. At Rocketship, we prepare our students to be successful, empathetic, and persistent change makers both inside and outside of the classroom. Check out these five ways our Rocketeers celebrated Earth Week this year, and get some ideas for how you can implement environmental awareness in your classroom. 1. Hold an Environmental Fair (and learn about consumer responsibility): At Rocketship Si Se Puede Academy parents partnered with school leaders to host a Environmental Fair for their school community. Parents and teachers were stationed at different booths with crafts and activities focused around recycling, reducing our footprint, and the impact of consumer behavior on the environment. Check out our Rocketeers in action below! 2. Have a Food Fight! (and learn about food waste): Did you know that over 45 million Americans are food insecure while 40% of food in this country goes uneaten? Not only is all of that food going to waste, but the water wasted every year to produce it is equivalent to filling a 1 ft. deep pool the size of the state of Florida. One way to teach kids about food waste, its impact on the environment, and how they can make healthy choices, is by participating in a program like the Food Fight Tour! Healthy Planet USA, the non-profit that runs the Food fight Tour, travels throughout the Bay Area with interactive and educational workshops for schools and organizations focused around our relationships with the food we eat. 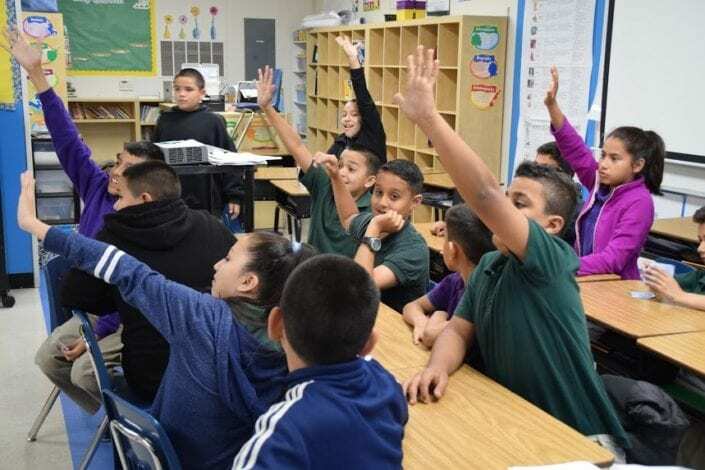 Rocketeers at Si Se Puede Academy found these activities particularly engaging, as their school’s fifth core value is centered around teaching students how to make healthy choices for their bodies and minds. Don’t live in the Bay Area? Check out these ideas on how to implement a food waste program in your school lunch room. 4. Deputize Students As “Litter Marshals” (for a lesson in leadership and accountability): At Rocketship Southside Community Prep in Milwaukee, Rocketeers made a pledge to do their part to keep their community litter free. The school partnered with the Milwaukee Police Department and Alderman Donovan, who deputized students as “Litter Marshals.” The added piece of leadership and responsibility gives students a sense of pride and responsibility when it comes to caring for their community and environment. This particular program was initiated by Keep Greater Milwaukee Beautiful Inc., with the intent of getting youth involved in their community. Check out the Milwaukee Neighborhood News Service’s coverage of the ceremony here. 5. Decorate Grocery Bags For Reuse (and partner with a local business): These paper grocery bags are getting a new life! This simple activity for Earth Day involves asking your local grocer to lend you paper bags for your students to decorate. Once the bags are decorated with environmental messages around recycling and reuse, they are returned to the grocer to be used in the community. This activity opens a discussion around recycling and consumer behavior with your students, and also helps form relationships with a local business. For more ideas on activities that teach environmental awareness check out these additional resources from Education World.